There are some people who will argue that if you keep everything in your phone you don’t need to write it down in a planner. So why write it down? Here’s why: Writing things down helps you remember them AND get them done. A study at Dominican University found that people who wrote down their goals, shared them with friends, and maintained accountability for them were 33% more likely to actually achieve those goals! The act of writing stimulates the reticular activating system (RAS) which forces you to focus on the task at hand, making you more alert. Also in more layman terms, using your hand to form letters involves more brain function so you’re more alert to what you actually writing. I keep most weekly work meetings in my phone calendar so each morning I am reminded of them when I wake up. And I admit I love the reminder feature on the iPhone that will tell me that I need to pay my electric bill by next week. However, I only really use electronic calendar on more of a day to day basis. It was really helpful in college, for knowing which classes I had that day. I also have a written planner where I use all sorts of colorful pens to remind me of what I have going on each day of the week. 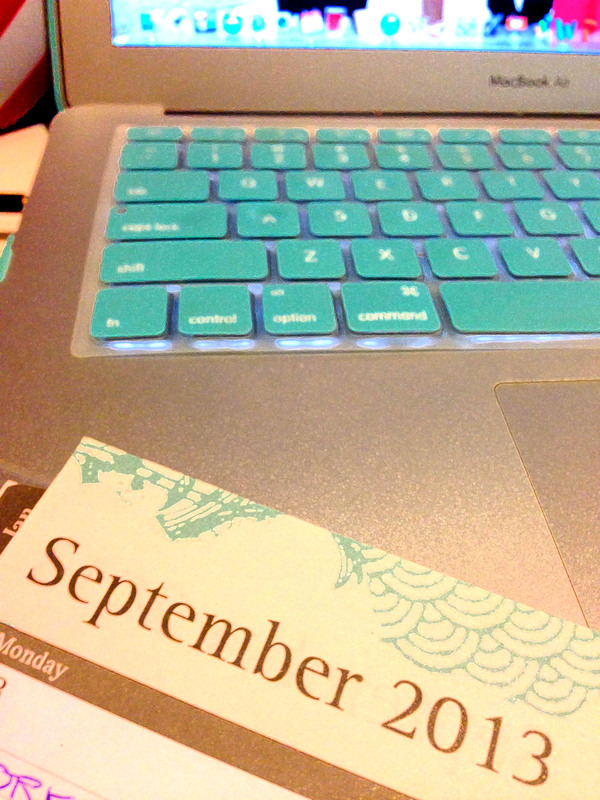 I use the written planner more for a weekly overview and to remember important days, such as a friend’s birthday. In terms of goals I tend to write in the color green small tasks I want to get done after work that are usually part of a larger personal project I am working on, like for instance, spending 30 minutes practicing a programming language. I also got in the habit this last month of writing down all my work tasks for the day in a notebook when I get in each morning. This helps me check off each thing I need to get done during the day, and also keep a log of exactly what I do which is helpful when I compile monthly reports. I’ve even started writing down lines of code to help me remember certain programming things. Of course, I would never write out more than a line or two, but its a nice reference to have and it helps me visualize everything a little bit better. So you’re probably thinking what does communication have to do with organization besides sharing a common suffix? Communication helps you stay organized because you do things more efficiently when you consult others about what you working on. A lot of the time coworkers may have encountered something you are working on at that time in one of their projects, because as “coworkers” they work on a lot of the same things as you. If they can offer a resource that will help you move along faster it could be worth bringing up. Also you may work in a team on a project and its so important to keep the lines of communication open so you can split up your time evenly. Most know about Google Docs already, but if not, I highly suggest it for collaborating on projects. If you’re working at an event where your team will be split up, try the app, GroupMe. It’s not as annoying as mass group messages, it’s free, most smartphones get it and you can manage multiple groups. This seems pretty basic, but there’s a rationale explantation about why this is so important. Whenever you try to procrastinate one of the things some people do is clean up to waste time, if it’s already clean though you can just focus on your work! Try to keep the main areas you live in, which for me is my bedroom as clean as possible. If your bed is always made you’ll be less inclined to hop in and doze off for a nap. If you clean daily you spend less time distracted, and don’t have to spend a whole day cleaning at a later date. It’s a real treat to wake up each morning to a clean slate, doing so will help you make time for what really matters. Also if you don’t get around to cleaning for a long time you’ll just end up feeling burdened until you do, so save yourself the stress. I’m not necessarily talking about backing up your computer, but that’s good too! Part of being organized is being prepared. I had a professor once pass along this tip: always keep a spare business appropriate shirt in the back of your car. He was a big coffee drinker, as I am as well, so after a few instances of spilling on himself and being trapped in meetings all day he starting bringing along an extra shirt. Obviously there is a lot you can’t prepare for, that’s what makes life fun. However like my professor, who would occasionally spill coffee on himself, it’s worth eliminating the risk. So figure out what your vice is and prepare for it so next time it won’t be such an issue. The most important thing is, not everything works for everyone, so find what works for you. Some studies suggest warmer temperatures increase productivity, and even pictures of baby animals. Find what works for you to stay productive and organized. Exactly, couldn’t have said it better myself.